The new Apple Watch is now official, offering one big highlight upgrade over the previous version: Built-in cellular support. Wireless cellular LTE connectivity provided by a built-in chip means the new Apple Watch will be able to stay connected even when it’s not tethered to an iPhone, which is a huge step forward in terms of making it an independent mobile device. 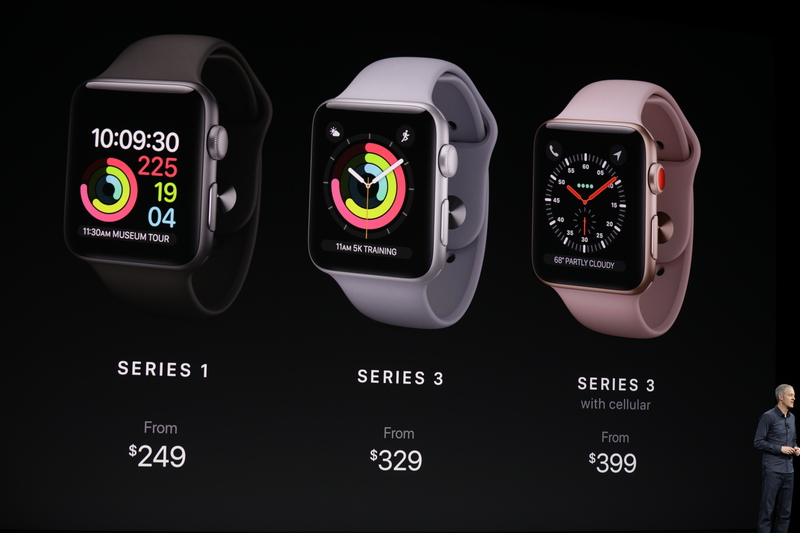 Pricing for the Series 3 Cellular starts at $399, and a version without cellular starts at $329. Pre-orders begin on September 15, and they’ll be available on September 22. The cellular version can be used without an iPhone at all. 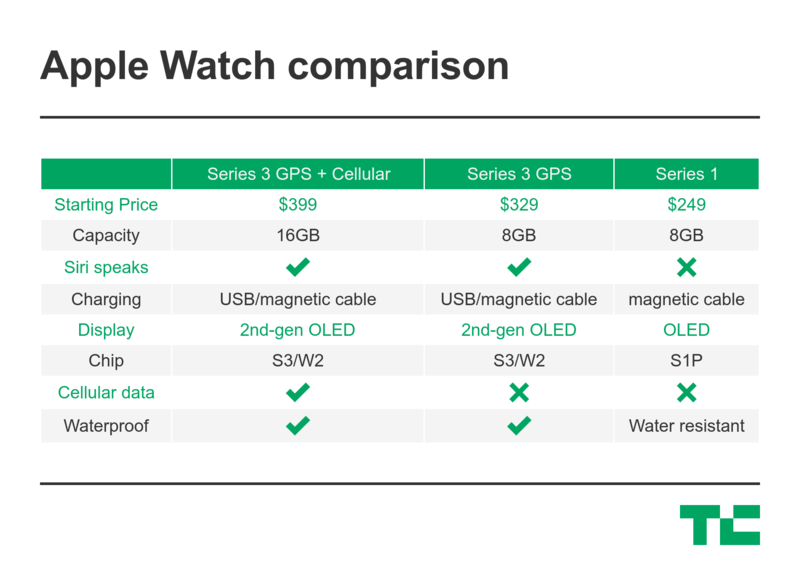 Here’s a table we made to visualize the Watch price and feature differences better. Basically, it means you can make and receive calls, as well as messages, while away from your iPhone using just the Apple Watch. The Watch will use a separate connection when away from the phone, but it will still use the same phone number so that messages and texts all get to you regardless of whether you have your phone or watch with you or not. 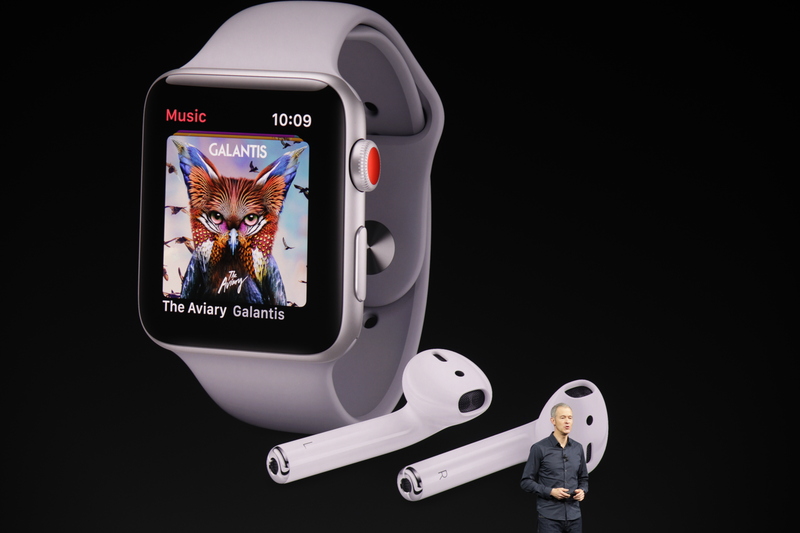 New cellular connectivity not only means you can take your Watch with you and use it on a run to track your stats, but it will also provide access to all of Apple Music without a connected device, starting next month. The new Apple Watch is visually quite similar to the existing version, with backwards compatibility with existing straps and bands. There’s a new Blush Gold color to match the new iPhone color option, and a new ceramic Dark Gray for the higher-end models that joins the existing white. Plus, the cellular version sports that red crown for an extra bit of visual flair. The non-cellular version doesn’t have the new red crown. Inside, it has a new dual-core processor with 70 percent better performance, as well as a new W2 chip that improves Bluetooth and wireless connectivity and power efficiency. The cellular antenna is actually the display itself, and there’s an electronic SIM card inside for connectivity. The device is the same physical size as the Series 2, despite adding everything needed for cellular and LTE connectivity — though the back crystal is extended 0.25 mm, which is incredibly thin. It’s still got GPS like Series 2, and it’s swimproof, plus it still packs in all-day battery life. Tim Cook touted an “industry-leading” customer satisfaction rate of 97 percent for the Apple Watch onstage at today’s event, and noted that it was the No. 1 watch brand in the world now, based on worldwide sales, provided it’s using the same metric as last year. Apple is also improving the heart rate app for Watch software with new features, including a heart rate complication for the main watch face, new measurements, including resting heart rate and a recovering heart rate that shows how fast your rate drops after you complete a workout. They’re also now notifying you when it detects that you have an elevated heart rate but you aren’t actually being active. And they’ll alert you when you have an arrhythmia, or an irregular heart rate compared to your usual stats. That could help it spot health problems earlier, including strokes, before they become more serious. To that end, it’s doing an “Apple Heart Study” with Stanford, coming to the App Store later this year. There’s also a new band called the “Sport Loop” that’s designed for use in outdoor active situations. There are also new Hermes bands and new watchface styles, and new color options across the band lineup.